As one of the biggest cheese exporters in the world, the Netherlands is synonymous with Gouda, the country's best-known cheese. There are many other varieties of Dutch cheese, ranging from hard, crumbly, aged cheeses to the softest and most delicate of chevres. This recipe collection places Dutch cheese in the spotlight, with cooking ideas ranging from sandwich spreads to salads, soups and so forth. 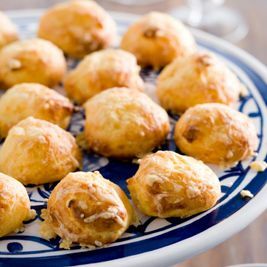 This recipe for cheesy choux pastry puffs uses a tasty Dutch raw milk cheese known as boerenkaas (the name translates as 'farmer cheese'). Serve as an appetizer with a good glass of red wine. This basic recipe for kaasstengels ('cheese stems') couldn't be easier to make and is ideal for those leftover bits of puff pastry that always seem to clog up the freezer. Our version uses aged Gouda cheese and salt & pepper, but you could add your favorite herbs, such as freshly chopped thyme or rosemary. Add punch and texture with some dried chili-, onion- or garlic flakes or sesame-, poppy-, caraway or cumin seeds. Many people don't know that cranberries grow wild on the Netherland's Wadden islands, where some 48 ha (119 acres) of cranberry fields can be found today.In this recipe cranberry port sauce adds zing to rich deep fried camembert cheese. These baked eggs with Gouda cheese, spinach, and leeks are the meal equivalent of a comfy cardi, suitable for even the most lethargic of moods when you want to eat well but can't muster the energy for anything too complicated. Made with iron-rich spinach, protein-packed eggs, and cancer-fighting leeks, this low carb choice will do you good, too. Serve family style with crusty spelt bread for breakfast or brunch. If you're having this for lunch or a light dinner, add a green salad. There's something deeply reassuring about making your own pickles and jams, such as this beet salad, which makes a terrific addition to any cheese plate and is particularly good with goat's cheese. These savory muffins are made with oude kaas, that delicious aged Gouda. We recommend Olde Remeker, but Old Amsterdam from the supermarket will do nicely too. And if you can't find that, simply use a good Parmesan cheese instead. The use of cumin seeds is, of course, a play on komijnekaas (Dutch cumin cheese). This effort-free vegetarian dip is made from pistachios, Turkish sheep's cheese (peynir), garlic, olive oil and parsley. Trust me on this - you'll be hearing ooohs and aaahs the minute people taste it. Serve as an appetizer, with (Turkish) bread, olives, and other dips. We usually make these puff pastry tarts to use up the previous night's leftover veggies. This particular version features hard Dutch goat's cheese ( Hollandse geitenkaas), mushrooms, leeks, beet, bacon, and rosemary, but you can substitute ingredients as you wish - there are endless variations on the theme. This seasonal spring tart with fresh green asparagus, puff pastry, ricotta, Parmesan cheese, tarragon, and almonds places the verdant spears in the spotlight - exactly where they belong. While they've become somewhat of a forgotten vegetable, parsnips were a staple food in the Netherlands before the introduction of the potato. This cheesy parsnip bake is great with a good steak and a simple green salad. The sweetness of roast beets pair perfectly with the salty tang of young goat's cheese in this easy yet elegant salad recipe, which also features walnuts, shredded mint and onions marinated in red wine vinegar. We've used Bastiaanse Blauw organic blue cheese for this flavorful witlof salad recipe, as well as Dutch Westland grapes and De Traay organic polder honey, but substitute whatever blue cheese, grapes and honey you love. This savory cheese cookie is an excellent addition to any cheese plate and makes a great snack on its own. Use themed cookie cutters for various occasions - we often make bell-shaped cheese cookies at Christmas time, bat-shaped cookies for Halloween or cheesy hearts for Valentine´s Day. Turnip greens (or turnip tops) may be something from our great-grandmothers' time but are so jam-packed with iron, dietary fiber, and vitamins A, B, C, and K that they are well worth rediscovering. These greens (known as raapstelen or keeltjes in Dutch) are actually the tender leaves of turnips or Chinese cabbage and taste like a cross between spinach and arugula.They are available in spring at health food stores, organic supermarkets, and farmers markets in Holland. If you can not get it where you are, simply substitute with a mixture of spinach and arugula. Kohlrabi is one of those forgotten vegetables that fell out of favor for a while, but is being rediscovered. Look out for it at your local whole foods market or health food store. This kohlrabi salad with ham and chevre makes for a satisfying crunchy lunch when you're home alone and want to have something healthy. This is the kind of dish that you just assemble as needed. It is all about frying off some bacon, cutting up a little Belgian endive, and assembling with crumbled goat's cheese, crunchy nuts and some fresh herbs. Served as a starter or appetizer it's simple but oh so tasty! This salad combines hot, sour, salty and sweet flavors from Northern Europe, the Mediterranean and Asia. It shouldn't work, but oddly, it does. Against a backdrop of peppery arugula, the tart taste of Northern European redcurrants, salty feta and briny black olives from the Mediterranean are complemented by an Asian-ish dressing of sweet ginger syrup, lime and spicy chile oil.